Worked for City of Bloomington for 16 years. Met my husband in 1986. Moved to California (Orange County) I 1988. Lost my husband in 2011. Judy Chambers Vivilacqua updated her profile. View. Judy Chambers Vivilacqua changed her profile picture. Judy Chambers Vivilacqua added a photo to her profile gallery. 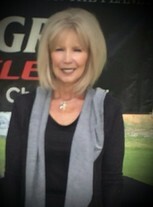 Judy Chambers Vivilacqua changed her "Now" picture. Judy Chambers Vivilacqua added a comment on WILLIAM H (Bill) Bliss' Photo. New comment added. Judy Chambers Vivilacqua posted a message. Hi Mary Ann. I did not get to go to the reunion but saw the pics. You look great. So sorry I missed it. I would loved to have visited with you. So wanted to attend our 50th reunion but things did not work out. Still living in California and loving it. Thank you so much Jeff Secord for sharing the wonderful pictures.